These spicy snacks are incredibly easy to make and they're also perfect to take to a potluck, bring tailgating, serve at a party...or just eat for a light snack. Mix all your powder spices with the vegetable oil. 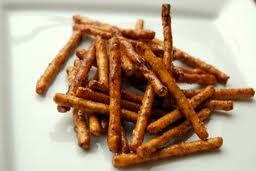 Place pretzels in a two gallon zip lock bag and then pour the mix over pretzels. Shake until well coated.